BRING YOUR FAMILY, FRIENDS, YOUTH GROUP, DON'T MISS OUT! BREAKING NEWS: "WE ARE MESSENGERS" Will be returning for JJF2018 - Stay tuned for more updates coming soon! Your support can help make this event an experience of a lifetime for so many people. Please consider making a donation today! All of your donations will be used to keep this event FREE of admission and to make this year the best ever. This year being our 15 annual event we will be reaching even more lives than ever. Your support will help keep this vision growing. Seeing lives radically transformed with the desire to serve God is the heartbeat behind WE ARE MESSENGERS. The band, originally from Ireland and now based in the United States, is led by Darren Mulligan, whose passionate vocals and poignant songwriting garnered the group’s first GMA Dove Award nomination. Powerhouse vocalist BLANCA has chosen the latter, as she boldly states in her self-titled debut, BLANCA. The last few years of her life have been anything but familiar. She got married, gave birth to her son and launched a solo career outside of Group 1 Crew, with whom she had spent her entire professional life. Pop recording artist and singer-songwriter Branan Murphy is no stranger to the stage. While in high school, Henry “Hank” Branan Murphy began writing songs and singing in his church. At age 18, he devoted himself to a career in music and spent several years performing at events all over the U.S., releasing two projects. Aaron Cole currently resides and was born in Bristol, VA, a small American town that rests on the border between Tennessee and Virginia. Much like his home town connects two neighboring states, Cole seamlessly bridges the gap between rapping and singing. Releasing six independent projects since the age of four. Since being radically saved out of the secular music industry by the hearing of the gospel in 1999, an overwhelming desire to share the good news of Christ’s gracious offer to “all who are weary” compelled musical couple Derek and Cristina Antunes into raw street evangelism. Adelaide is a National Touring Contemporary Rock Band whose primary focus is sharing the Gospel of Jesus Christ through profound yet relatable lyrics and music. Adelaide is quickly gaining international attention through airplay and live performances. They are the most energetic, positive, hilarious group of guys to hit the music scene in a while. What makes them special as individuals and as a whole is that their sole purpose is to bring a message of hope and love through the belief that dreams really do come to life. Jarrell’s aspires to make music that brings people together. His blend of hip hop with pop, gospel, and rock allow him to engage people from all walks of life at every show. His goal is to use his musical influence as a springboard to build artistic communities that create disciples who change the world. A band comprised of 5 experienced musicians who share a love for rock and a passion for God and spreading the gospel of Jesus Christ. Get a special discounted rate for hotels thanks to HAMPTON INN. Click on the logo for more information. 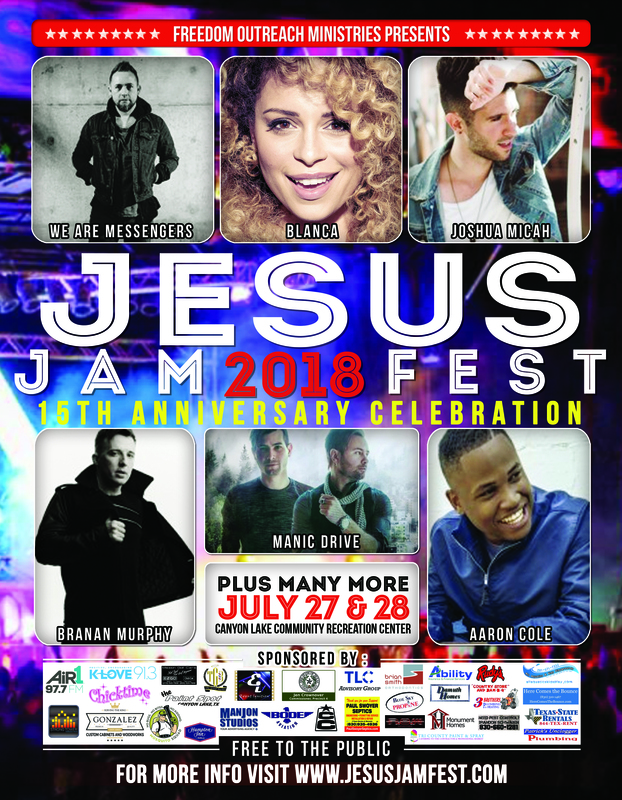 WANT TO BE A VOLUNTEER – If you are interested in participating in Jesus Jam Fest as a volunteer, we would love for you to be part of this amazing event. Simply click on the button to the right and fill our our volunteer form and our volunteer coordinator with be in contact with you. Thank you for your interest.